Iowa’s career leader in points. A 2017 All-Big Ten First Team pick (Coaches) and a three-time Second Team all-conf. pick by media (2015; ’16; ‘17) … 2016-17: Became Iowa’s all-time leading scorer 3/16/17, passing Cindy Haugejore’s 2,059 (1976-80). Was Nat’l Academic All-America of Year for second straight year. Hawkeyes’ No. 2 scorer on season … 2015-16: Voted captain by teammates. Paced Hawkeyes in scoring, tallying double figures in every game, en route to All-Big Ten Second Team acclaim. Nat’l Academic All-America of Year (owned highest GPA, 4.03, of all Academic All-Americans) … 2014-15: Second Team All-Big Ten; also only soph nationally to be named a CoSIDA Captial One Academic All-American (Third Team) … 2013-14: Made immediate impact; was second among freshmen in Iowa history in scoring and earned Hon. Mention All-Big Ten honors. Netted team-high 20 points in Big Ten Trnmnt title game … PREP: Miss Iowa Basketball; Iowa Gatorade POY as senior. Led West to its first state trnmnt as a soph and helped Trojans claim state title the next year. Also a standout in track, volleyball … MISC: Interned last summer in Chicago with PricewaterhouseCoopers; has another internship lined up in NYC with Barclays this summer. 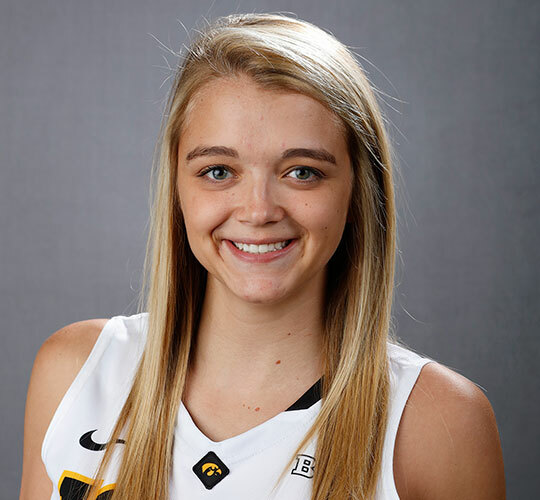 Played AAU ball for All Iowa Attack, an Ames, Ia.-based program 2 hrs from her Iowa City home. Mother, Missy, played basketball and softball at Drake University.